Haryana is a state in North India with its capital as Chandigarh. It was carved out of the former state of East Punjab on 1 November 1966 on the basis of language distribution. The name Haryana is found in the works of the 12th century AD Apabhramsha writer Vibudh Shridhar (VS 1189–1230).It is bordered by Punjab and Himachal Pradesh to the north, and by Rajasth an to the west and south. The river Yamuna defines its eastern border with Uttar Pradesh. Haryana surrounds the country's capital Delhi on three sides, forming the northern, western and southern borders of Delhi. Consequently, a large area of south Haryana is included in the National Capital Region for purposes of planning for development. The state was home to prominent sites of the Indus Valley and Vedic Civilizations. Several decisive battles were also fought in the area, which shaped much of the history of India. These include the epic battle of Mahabharata at Kurukshetra mentioned in Hindu mythology (including the recital of the Bhagavad Gita by Krishna), and the three battles of Panipat. Haryana was administered as part of the Punjab province of British India, and was carved out on linguistic lines as India's 17th state in 1966. Haryana is now a leading contributor to the country's production of food grains and milk. Agriculture is the leading occupation for residents of the state with the flat arable land irrigated by submersible pumps and an extensive canal system. Haryana contributed heavily to the Green Revolution that made India self-sufficient in food production in the 1960s. Haryana is one of the wealthier states of India and had the second highest per capita income in the country at ₹ 119,158 in the year 2012–13 (See List of Indian states by GDP) and ₹ 132,089 in the year 2013–14 including the largest number of rural crorepatis in India.Haryana is also one of the most economically developed regions in South Asia and its agricultural and manufacturing industry has experienced sustained growth since the 1970s. 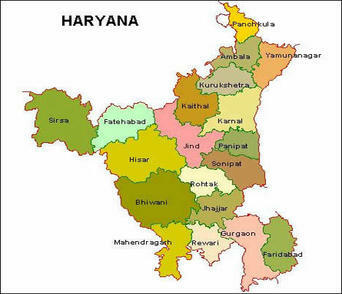 Haryana state was formed on 1 November 1966. The Indian government set up the Shah Commission under the chairmanship of Justice JC Shah on 23 April 1966 to divide the existing Punjab, India and determine the boundaries of the new state of Haryana after consideration of the languages spoken by the people. The commission delivered its report on 31 May 1966 whereby the then districts of Hisar, Mahendragarh, Gurgaon, Rohtak and Karnal were to be a part of the new state of Haryana. Further, the tehsils of Jind and Narwana in the Sangrur district along with Naraingarh, Ambala and Jagadhri were to be included. The commission recommended that the tehsil of Kharad, which includes Chandigarh, the state capital of Punjab, should be a part of Haryana. However, only a small portion of Kharad was given to Haryana.The city of Chandigarh was made a union territory, serving as the capital of both Punjab and Haryana. Bhagwat Dayal Sharma became first Chief Minister of Haryana.